Leon Maloney’s hat-trick inspired Pompey Academy to victory at Bristol Rovers in the Youth Alliance League south west division. The forward netted a treble in Mark Kelly’s side’s 4-2 win at Lodge Road. Oscar Johnston was also on target for the visitors. Maloney broke the deadlock after just two minutes after he was teed-up by Stan Bridgman. The Blues took a one-goal advantage into half-time, although the Gas slightly hit back shortly into the second period through Zain Walker. Maloney restored the visitors’ advantage when he drove into the box before firing a shot beyond the Rovers keeper. The home side responded well, though, and Jamie Bremner levelled. 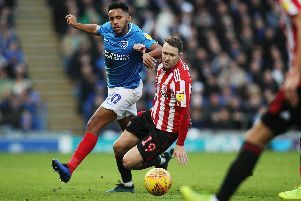 Pompey were determined to return to the south coast with all three points and again moved in front. Eoin Teggart and Liam Kelly linked well down the left before Maloney worked the ball to Johnston, who rounded off the move. And the Isle of Wight talent, who featured for Bognor on Tuesday night, completed his hat-trick in style. The second-year scholar bent a brilliant free-kick into the top corner to wrap up the Blues’ win.